This might be the dumbest question in the world, but how do you get the feathered chalk edge around the outside of the multi-plane backgrounds. And more importantly - why choose that style? Is it indicative of the final style, or just placeholder art? I draw these guys in photoshop using a custom brush. So when you see the finer line work, like in the image below there is still some roughness there, but it's subtle. When you bring the brush size up, it's basically a blown up version of that, so it becomes this big chalky thing. 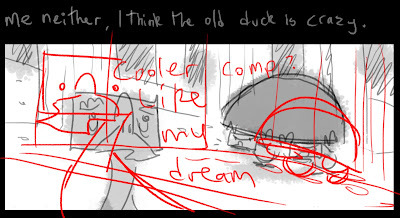 For the roughs I like to keep them... well... rough. The clean version's will use a proper line style and all that, but keeping everything so messy is great because you don't get too attached and it doesn't have that gross stagnant clean feeling. The final product will look more like my other art around the blog, where the linework is cleaner but the colouring is still fairly "blotchy".